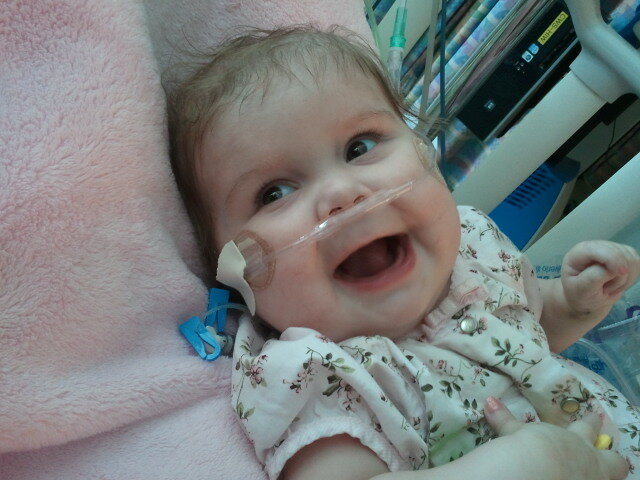 After Annabelle’s heart transplant, when we finally graduated out of the ICU, we were all smiles. It was weird, because it was to be the LAST time Annabelle was in the ICU. Obviously, that wasn’t to be. But this time, as we were coming down the hallway to the elevator that would take us up to 6C “the floor”, I smiled. “THIS is the last time we are leaving the ICU!” Even as I said it, I prayed I wasn’t speaking too soon. Sure enough, we got to the elevator, and a nurse came running behind us. Evidently they hadn’t officially put in the transfer orders yet, so we weren’t allowed to actually leave. We had to go back… you guessed it… to the ICU. I grinned, because I think God just had a fun sense of humor that way. A half hour later, we really DID make it out of the ICU. That’s how Mommy feels too!!! Her echo this morning looked even better than Friday, which is GREAT news! She is on 3/4 of a liter… sats are a little lower today than they were yesterday, so I’m a bit worried about that, but it might just take a little time, so I’m not stressing over it. As a side note, a while ago, my hubby put fun signs in our yard that say GET WELL ANNABELLE, and when she comes home… WELCOME HOME ANNABELLE. I don’t mind this, but I DO mind that he’s now plastered our cars with “Pray for Annabelle”. Well, I don’t mind that, she can use ALL the prayers she can get, but he’s also added my blog address, which is slightly (very) embarrassing. So, if you are coming to my blog because of that, please know that it was my loving, wonderful, well-meaning husband’s idea, NOT mine. Unsure of what they are thinking about regarding a “go home” date. A lot will depend on if they are still okay with us going home on oxygen. Hope to know more tomorrow after doctor’s rounds tomorrow! Look at that precious smile!!!! YAYYYYYYYY!!! I love, love, love that smile! Gorgeous smile. I smiled, too, as I read the good news. LOL @ your hubby. That's so sweet of him. Love,love,love that big ole grin. She looks really, really great. God does have a sense of humor, learned that when our hospital had a bomb threat which forced us to stay in nicu longer than we'd told everyone. So happy for you all 🙂 Happy,happy,happy! our loving Father has the best sense of humor & we're glad you are able to enjoy it. Our prayers continue for Annabelle, you and your family and the those treating her. It appears your journey is just a bit longer than you anticipated so continue to relax in His arms. We regularly see your blog thanks to Christina's FB updates and will continue to pray! Oh my goodness, that picture of Annabelle says it all! I am over the moon thrilled for Annabelle and your family and the positive good news that keeps coming. What a precious little angel she is! Continued prayers…. I'm so happy she's out of ICU. And she looks so great! *grin* And I like your husband. That's my kind of man, lol! Great action! As a new neighbor that saw the signs and has been praying, I would like to thank your husband for putting the blog on your cars! 🙂 I have been wondering what was wrong and was worried when the welcome home sign was down. I was so excited for yall when I saw the Happy Heart Day and it was on my son't birthday! Beautiful smile! So happy for you! I got goosebumps looking at those pictures – beautiful!! That is AWESOME news. I do believe God has a sense of humor or I would not have a 20 yr old, 14 yr old, and a 1 yr old. God is so so good and I am so thankful you are on the floor! Praying that she will be doing good enough to go home soon. 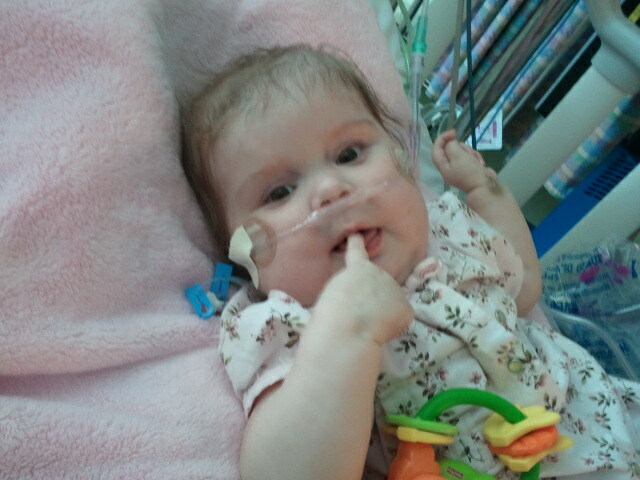 I LOVE seeing pictures of Annabelle feeling so much better! She looks so happy and adorable! I think your husband's idea is a great one. I know for you it seems embarassing that your blog is being "advertised", but it's just so that people can know why they're praying for Annabelle and who she is. As always, I am praying for all of you. Krista, my friend said she was driving behind you the other day on 65. HA!!! I was telling her about my niece and she said, Hey, do they have a green mini-van. I got a kick out of that. – Love your sister! I am not Julie!!!! I am Jami!!! My heart is overjoyed by her smile! Love, love, love the pics of Annabelle; especially the one of her grinning ear-to-ear! We have a similar picture of Daniel after he had his bi-directional Glenn. He was on the floor and we told him we were going home! The smile is very similar! What wonderful news that things are going so well and progressing so quickly! God is good all the time and all the time, God is good. Will continue to pray for you and your precious family. I think it is a wonderful thing that your husband has done! Kudos for his thoughtfulness! Please don't let it embarrass you. Been praying for Annabelle and following your blog for quite some time. I'm so happy to hear that she's doing so much better. What a miracle and inspiration she is to us all.